In the age of cybernation, Citrix XenApp has emerged as a prolific application virtualization product. This powerful solution enables users or an enterprise to have centrally hosted and managed applications on corporate servers which can be accessed remotely from a wide range of computer and mobile devices. To deliver shared hosted virtual desktops and applications, XenApp synchronizes with Citrix tools such as NetScaler Gateway that offer secure remote access. Giving you an insight into configuring, managing, and optimizing the advanced features of Citrix XenApp, this practical guide starts by helping you establish Remote Desktop Services and understanding the Citrix Licensing protocol. You then get a walkthrough of the Citrix Web Interface and then finally move on to successfully manage your XenApp server using PowerShell and command-line tooling. 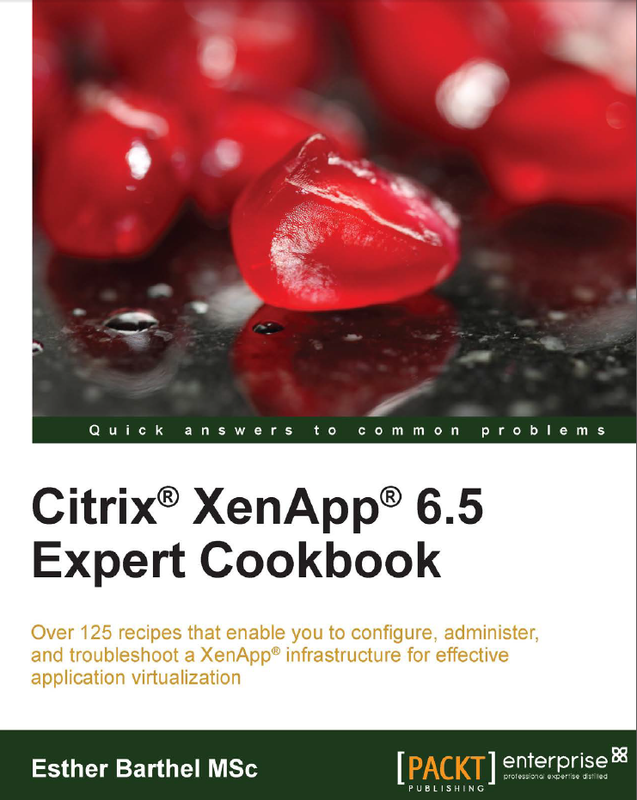 "Citrix® XenApp® 6.5 Expert Cookbook" clearly teaches you to work with the XenApp tool to deliver published desktops and applications from a XenApp server to the end user. Packed with practical recipes, this book starts with helping you understand the basics of Remote Desktop Services and proceeds to explain in detail the usage of Citrix License servers. Furthermore, you will learn to utilize the Citrix web interface, which acts as the central portal where users remotely access their desired applications. Next, you will move on to the key technical implementation of the NetScaler Gateway tool which Citrix uses to provide secured services. Finally, you will advance to learn about the basic management consoles and tooling, configuration, and troubleshooting methods of XenApp with command-line tools and PowerShell scripts. You will also get a glimpse into the buzzing Citrix community by learning some great additional tools and scripts built by Citrix community enthusiasts. This guide is an invaluable tutorial to help you to explore and optimize the XenApp tool to virtually deliver desktops and applications.